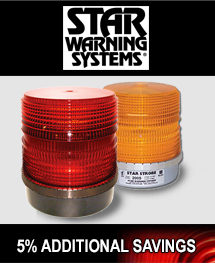 Vehicle Safety Supply offer over 10,000 emergency and work vehicle lighting accessories. The main warehouse is located in New York with distribution points around the United States. 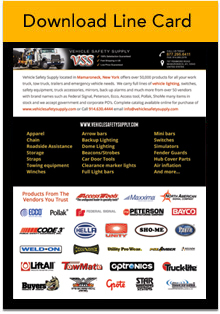 VSS is proud to carry top brand name products such as Peterson, Federal Signal, Pollak, Buyers, Ecco, Truck-Lite, North American Signal, PSE Amber, Code3, ShoMe/ABLE2, Unity, Preco and Star Products. Since the inception of Vehicle Safety Supply the focus of the company has always been excellent customer service and a staff that offers deep unrivaled knowledge of our product offerings. VSS prides itself on having sales staff that has not only sold the products carried but has overseen delivery and installation on a variety of the specialty items. Over the years Vehicle Safety Supply has built a reputation as a market leader but has always worked to ensure that it remembers the business is built on its reputation of taking care of each customer one at a time. We look forward to servicing you and your business.